Successfully Added 8 Inch 3G Tablet PC - HD Screen, Quad Core CPU, 1GB RAM, Dual SIM Slots, OTG, Android 4.4 to your Shopping Cart. With phones getting bigger and bulky tablets a large turnoff for many this 8 inch 3G connected tablet PC hits the perfect balance between functionality and portability. This Android Tablet PC is a great way to browse the web, enjoy fun games and watch your favorite films. It comes with an 8 Inch 1280x800 HD display so you get a beautiful viewing experience with nice color depth and sharpness, fantastic for those long journeys or keeping the kids entertained on a rainy day. One of the main highlights and benefits to this little tablet PC is its dual micro SIM slots that bring 3G connectivity, this allows you to leave the phone at home as you can take and make calls direct from this device. You can also enjoy great cellular data connectivity when on the go so surfing the web or reading the latest news on your daily commute is quick and easy. The Quad Core 1.3GHz processor along with 1GB of RAM bring a solid performance so you can enjoy fast seamless functionality whether playing games or watching movies. With a significant 16GB of internal storage you will have plenty of space for games and movies a plenty, and you can always exspand this via the micro SD card slot. 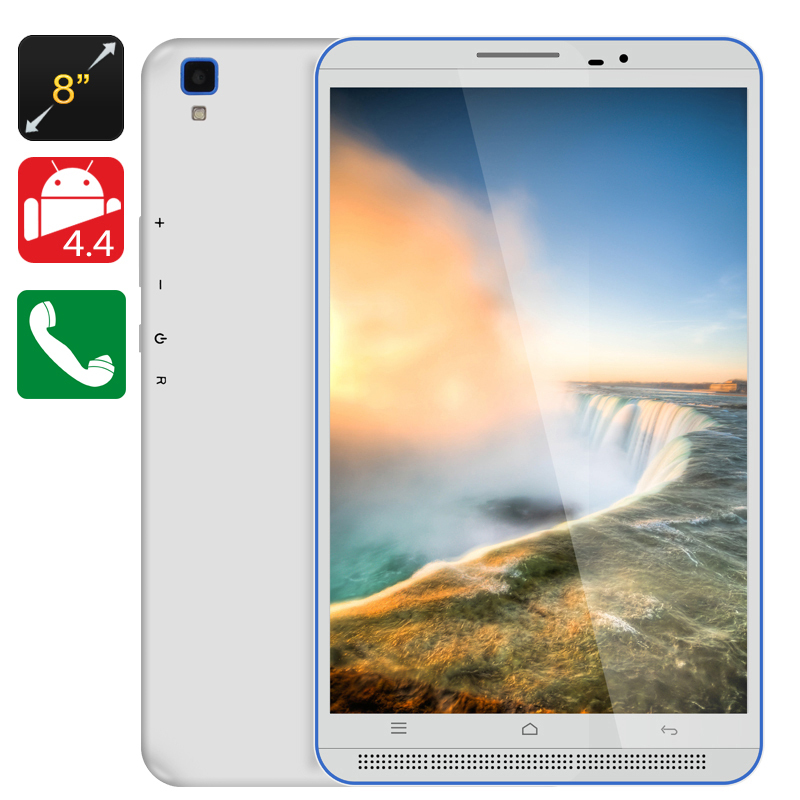 Android 4.4 is the OS of choice on this Tablet PC and bring all the tools and customization you would expect while offering a reliable stable platform capable of streamlining your multitasking letting you get the most form this Tablet PC. This 3G Android Tablet PC comes with a 12 months warranty, brought to you by the leader in electronic devices as well as wholesale Tablet PCs..